This comfortable home is located on a canal with 2 bedrooms (Queen beds) and 2 full bathrooms. It has a beautiful screened-in porch with comfortable seating for relaxing and a dining table with seating for 6 for comfortable outdoor dining. The house has central AC with ceiling fans in each room to keep you cool and comfy. Bring the family and your boat to Croton Lane Retreat and you won't be disappointed. There is a large concrete dock with step down and ladder. There is also a fish cleaning table. The living area has a nice futon/sleeper sofa, a 43 flat screened TV with a blue ray disc player and brand new comfortable and cozy seating. The kitchen is fresh and bright with all the necessities. It includes all the upgrades and is a pleasure for cooking. The dining room table seats 4 with two stools for the counter. 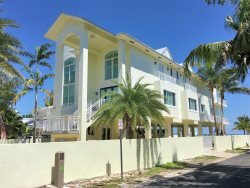 Located in a quiet area on Big Pine Key, you will enjoy beautiful surroundings and have plenty to do. Enjoy all the unlimited water activities like swimming, fishing, and diving the Keys has to offer. Discover an assortment of Florida Keys wildlife featuring birds, iguanas, and Key Deer in your yard. Big Pine Key Park is located within walking distance of the home and a few miles down you’ll find a shopping plaza hosting Winn-Dixie, Artists in Paradise, Beall’s Outlet, Radio Shack and branch of the Monroe County Library with Wi-Fi internet access. Take a trip down to Key West for the daily sunset celebration or a romantic sunset cruise. Or visit one of the many venues offering the finest in live entertainment and great food. Be sure to take a stroll up and down Duval Street and visit the art galleries, shops, and more! Hire a charter boat captain, or go for a sunset cruise on one of the Schooners down at the wharf. Plenty of restaurants and bars down every street, Key West is a hot spot for travelers and locals.